Well, the answer is yes — and it could just be the best tomato you’ve tasted in your life. Press into it with your wooden spoon and witness how it yields to the touch. Then — without warning – it bursts into a pool of juices, mixing with the salt, daring the diner to lift the plate and slurp on the clear fluid like it was the nectar of the gods. Slow grilled Shushu tomato served with salt from Setouchi region. In an age where heading to a Japanese restaurant means being served course after course of assorted endangered marine life, the simple dishes at Kyuu by Shunsui feel as clean and crisp on the palate as a cool gust in autumn. Here, the simplest of ingredients are given their time in the limelight. The tomato in question here is the Shushu variety from Oita prefecture. That salt? From the coastal region of Setouchi. It’s been sitting on the robatayaki grill for as long as you’ve sat there, where a slow gentle ember caresses the sweet-umami magic out of its flesh. 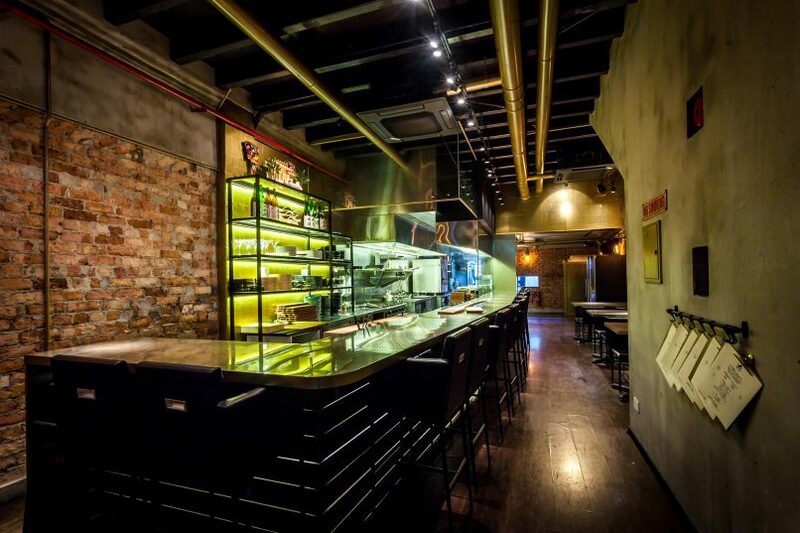 It’s a marked departure from 999.99 (pronounced Five Nines), the Japanese restaurant which formerly occupied the same shophouse space on Keong Saik road. That concept has now shifted to Cuppage Plaza and the 32-seater Kyuu by Shunsui, the offshoot of Kappo Shunsui has taken residence. These Japanese restaurants are by the same owner – whom we are told are in the gold industry and prefer to remain under the radar. The ambience is the same as at 999.99 – a row of counter seats flanked by tables by the front and facing the wall. The main difference is the presence of the robatayaki grill, and despite the quality of the food which would otherwise be right at home in a formal Japanese restaurant, the vibe here is friendly and relaxed. 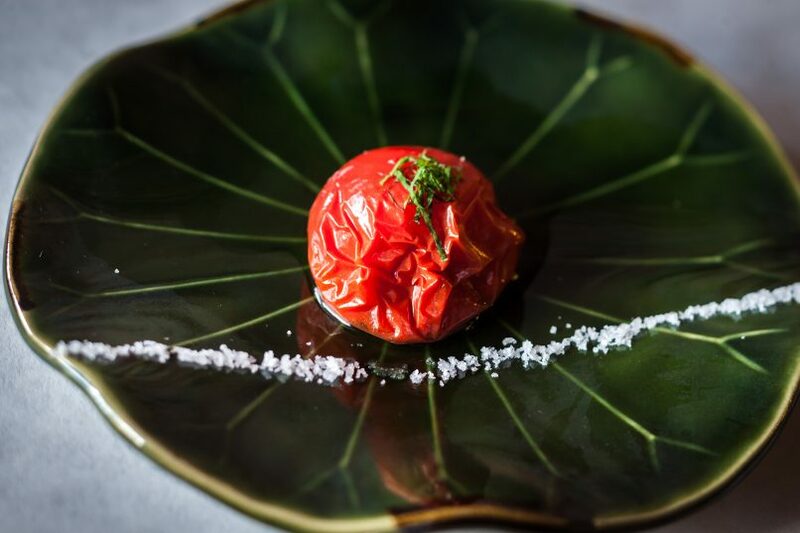 The wonderous tomato is part of a 10-course omakase menu ($129++) that includes a three part appetiser, sashimi and a strong focus on its grilled offerings followed by a rice dish before ending with home made ice cream. Nearly every plate we had was a hit – from the starters which saw figs so ripe it tasted like jam to the homemade sesame tofu and the gently braised duck. These were coated with luscious pastes like the sumiso (miso, rice vinegar and sesame paste) for the figs and home made miso for the duck. The assortment of sashimi is a draw for many and here, the fish is aged to perfection. Take your pick from a delighful range of tuna belly, red snapper, scallops and uni served on teaspoons with salmon roe. These raw slices are served on a round platter and garnished with a sprinkling of crysanthemum petals – a reference to the seasons as the flowers bloom in autumn as much as it is a nod to the symbol of the country itself. Still, sashimi itself is in no way special as one can get it in just about any decent Japanese restaurant. Even establishments that boast having seafood flown in from Tsukiji Market has become common. It is in the robatayaki that Kyuu shines, for the kitchens have truly mastered the delicate balance of time and temperature. 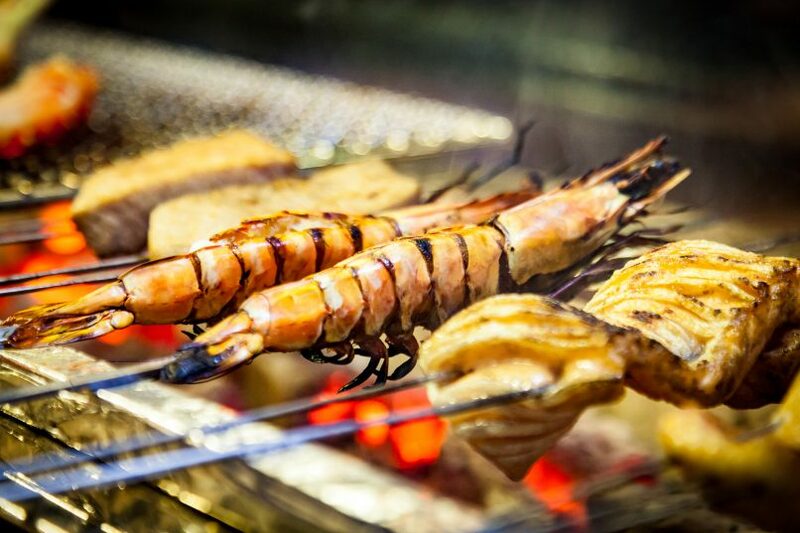 Two items from the charcoal grill stand out: The first is the giant prawn served with a wasabi sauce. It is fished off the waters of Indonesia and cooked until the flesh is firm yet sweet. When placed over the grill, bits of its shell become charred which infuses the fragrance of smokiness into the prawn. The other is the Kagoshima A4 Wagyu Beef Aitchbone With Red Miso Fond De Veau. Here, chunks of beef are skewered and placed over dancing flames, letting the fat render out and the meat cooked with a caramelised texture. This is sliced, then served on a plate with the fond de veau (a meat stock that’s reduced into a gravy) that’s mixed with red miso. The result is a flavour bomb that offers bite after bite of wagyu so tender it seems to just disintegrate on the palate. Not full? The rice course comes next and the staff will ask if you’re after the small, medium or large bowl. 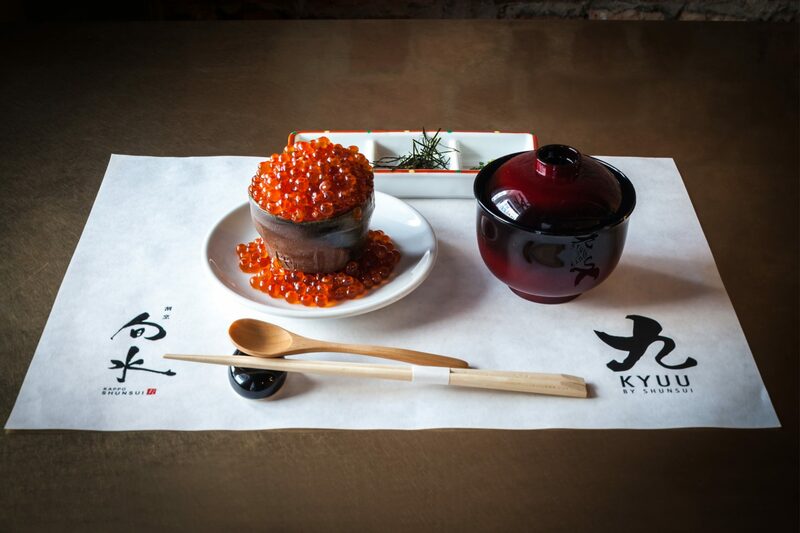 Whichever way, the chefs will then start piling on ikura until the entire bowl runs over. It’s a treat for the eyes to see the orange neon pearls overflowing with such unruly abundance. There are many excellent Japanese restaurants in Singapore and there is no doubt that Kyuu is in that league. There’s a quiet confidence, and a restrained elegance in its food that makes its omakase menu almost affordable for the quality one might get. If you’re after the refined experience of a $500 bill then you might not find it here, but if it’s respect for the provenance of the ingredients and good honest food you’re after, then Kyuu by Shunsui will tick all the right boxes. Most of all, the restaurant stands as testament that one does not need to rely on the tired tropes of luxury Japanese ingredients for a taste of Japan. Sure these ingredients are on the menu, and some will be served to you, but it is in thrusting the humble tomato and the humble fig into the limelight where this gem truly shines. Price: Approximately S$150 per person. Service: Polite and engaging with attention paid to every diner around the counter.